The detailed results of the measure analysis in application to the collected measure examples on a case by case basis (Table 22) are available via www.tide-toolbox.eu. Hereinafter, overall results of the measure analysis in view of main and additional evaluation criteria are presented (chapters 5.2.1, 5.2.2). The aim of this part of the measure analysis was to roughly estimate the degree of target achievement (high, medium, low, not clear yet) by describing and estimating the effectiveness of a measure related to its development targets. Table 25 gives an overview on the results. *Measures not assignable to one single measure category are listed multiply. This refers to 3 of 39 measures. For most of the executed measures (32 of 42), a high or medium degree of target achievement was indicated. Only for few measures (2 of 42), the measure effectiveness in view of the development targets was indicated as low. Mainly for measures still in the planning stages (e.g. measure 02, 36, 28, 39), the degree of target achievement was indicated as not clear yet. The high number of measures positively assessed proves that mostly good practice examples were integrated into the measure compilation. Another observation made according to the vast majority of measures is the exclusively qualitative definition of development targets without clear indication of a time plan for the target achievement. As a consequence, a transparent scientific evaluation in terms of development targets hardly takes place in the frame of the monitoring investigations. Therefore, it has to be stated that the estimation of the measure effectiveness considering the development targets undertaken in this study is mostly based on expert judgment, i.e. individual interpretation of available monitoring results. The aim of this analysis step was to roughly assess the expected measure impacts in view of the range of ecosystem services as defined by JACOBS 2012 based on an estimation of habitat surface and functional quality before and after measure implementation. Also, the expected measure impacts regarding different beneficiary groups were assessed. Both approaches allow illustrating potential co-benefits of management measures using the ecosystem services concept. The assessment of ES for estuarine management measures is provided by multiplying the habitat changes realised by the measure with the scores for ES supply per habitat type (JACOBS 2013 ). The result is a score that maps the expected impact of the measure on the supply of ES (see § 3.2.1.2 Impact on ecosystem services (ES) ). The expected impact on the targeted ES is limited or positive for most TIDE measures. It can be stated that the measures generate overall many co-benefits, i.e. many not targeted ES are positively impacted. In detail, the expected impact on the habitat services (‘biodiversity’) and on cultural services is positive for most measures while the impact on the provisioning services is mostly negligible. Regarding the regulating services, the expected impact is positive on one part of the services (e.g. R1, R2, R5, R7, R8, R12) and negligible on the other part (e.g. R3, R4, R6). The positive results on ES for most TIDE measures could be a consequence of the measure selection. Since most of the measures considered are biodiversity-targeted and examples of good practice, high scores for habitat, regulating and cultural services are expected while the anticipated impact on provisioning services is limited. The dominance of positive scores could also be explained by the fact that the ES assessment is restricted to the boundary of the measure. Effects on adjacent land are not included. Hence, a conversion from adjacent land into estuarine habitat will cause positive effects on the supply of ES in the measure area. Negative effects will consequently only occur from a conversion from one estuarine habitat type into another, with the latter less suitable to supply certain ES. Most TIDE management measures are about the conversion of adjacent land into estuarine habitats. For a specific type of measures that are aiming at regulating sedimentation patterns or altering sedimentation, sediment quality and erosion processes in a beneficial way (e.g. measure 12 Reiherstieg HPA (2012l), Pilot project Walsoorden (VOS et al. 2009), measure 02 Medemrinne (HPA 2012b), measure 19 Ketelplate (APA 2012g), measure 11 METHA (HPA 2012l), the chosen method to indicate the impact on ES delivery do not archive the best results. Even a positive effect on the targeted ES could not be approved in some examinations. Based on the ecosystem services concept, the ES assessment realized in the frame of this study represents a first screening in order to show the co-benefits that are generated by implementing the measure. It would be interesting to apply the assessment approach to measures to other measure types such as fairway deepening, maintenance dredging and creation of barriers because the global image of the expected impact on ES would probably be a different one. The scope of this study was however limited to the selected TIDE measures. The results of the ecosystem services assessment regarding different beneficiary groups can be taken from table 27. The expected measure impact for indirect and future use of ES is neutral to very positive. More measures are expected to be very positive in view of future use meaning that they generate a more long term positive expected impact. Since there is almost no impact on the provisioning services, no expected impact on direct ES use has to be stated. Regarding the local, regional and global use of ES, neutral to very positive impact for local and regional use is expected while the anticipated impact for global use of ES is neutral or slightly positive. Table 27: Overview on the results of the ecosystem services assessment in view of expected measure impacts on beneficiaries. The expected impact of the TIDE measures on the different beneficiaries is very similar (mainly indirect and future and mainly local and regional). This is also a consequence of the measures selection (s.a.), but moreover of the list of ES considered. The selected list of the 20 most relevant ES for estuaries consists of 1 habitat service, 3 provisioning services, 12 regulating services and 4 cultural services. Hence, the overall expected impact on the beneficiaries is dominated by the regulating services (which is mostly linked to indirect and future use and to local and regional use). If -for instance- the regulating services would be more clustered and provisioning services would be split up into more categories, this would also change the global image of the expected impact. The indication of conflicts and synergistic effects regarding uses that occurred in the course of measure planning and implementation was estimated on a case-by-case level based on expert judgement (insider perspective). The results for the TIDE measures can be taken from the measure surveys (chapter 3.1) and the measure analysis results (chapter 3.2). In 13 out of 39 measure examples the main conflicts that derived from the measure implementation were specified. Most of the conflicts (~60%) that were observed during the implementation of the examined measures, occurred between the new management targets of the site and former uses that were now impossible or restricted (e.g. agricultural use, hunting, recreation). Regarding the realignment sites were new dykes had to be build safety concerns of the local inhabitants were seen as conflicts. Additionally the insufficient attainment of the stated development targets because of too high sedimentation rates on the sites was seen as a conflict. The synergistic effects that can be high-lighted in almost every measure are the combination of flood protection, nature conservation and recreational purposes. In four measure examples synergistic effects between maintenance dredging (sediment management) and nature conservation can be observed. The aim of this part of the measure analysis was to roughly estimate possible measure effects in view of WFD aims in order to map potential benefits and conflicts that can be expected due to the implementation of management measures in estuaries. The estimation of potential conflicts and synergistic effects of measures in view of WFD aims was based on the identification of the main pressures the estuary zones of the TIDE estuaries are affected by (pressures screening). To identify the main pressures, a survey was developed by NLWKN and filled in in the course of expert meetings (Regional Working Group meetings) held at the four TIDE estuaries. The survey can be taken in detail from annex 10.2 (Table 38 - 42). As a result, the main pressures indicated in table 28 were identified. 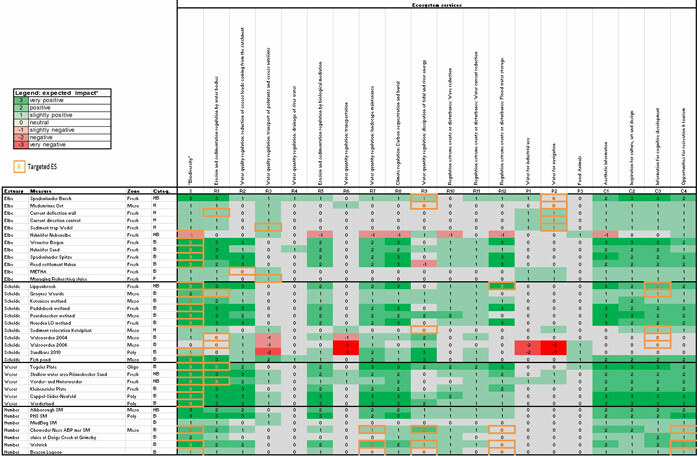 The results of the pressures screening as represented in table 28 show that the range of potential main pressures in view of the TIDE estuaries was well covered by the EIIs given. This statement can be underpinned by the fact that the option of introducing additional EIIs was not seized at the four TIDE estuaries. For each TIDE measure, potential effects in view of the main pressures identified for the estuary zone where the measure is situated were indicated according to a simple valuation system (very positive, positive, no effects, negative effects, very negative effects) and additionally briefly described. A potential positive measure effect in view of a main pressure is interpreted as an indication of effectiveness in view of WFD objectives respectively in view of WFD quality elements. A potential negative effect is interpreted as an indication of conflicts in view of WFD requirements respectively in view of WFD quality elements. This interpretation is based on the hypothesis that a measure is the most effective if it tackles the main pressures the respective estuary zone is affected by and consequently in that case also has positive effects in view of the WFD quality elements. The results of the estimation of measure effects for all TIDE measures are compiled in table 29. 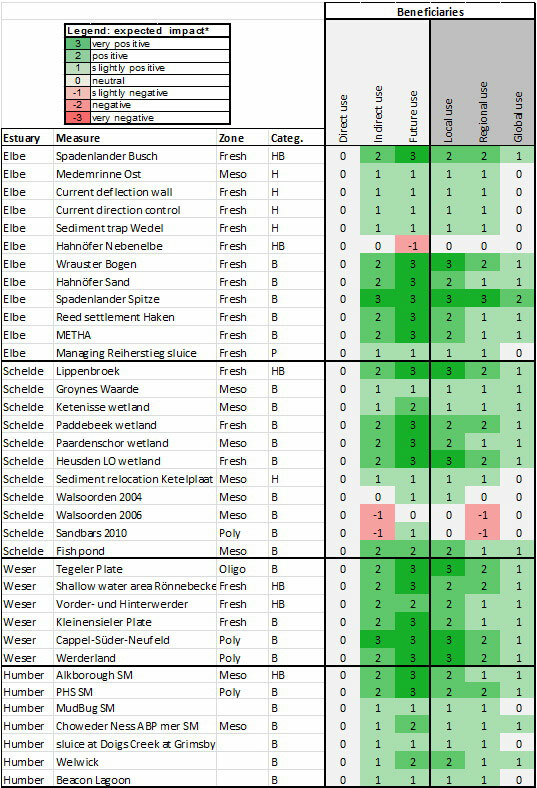 Table 29: Indication of measures with very positive and positive effects on main pressures of the TIDE estuaries (classification by measure categories). 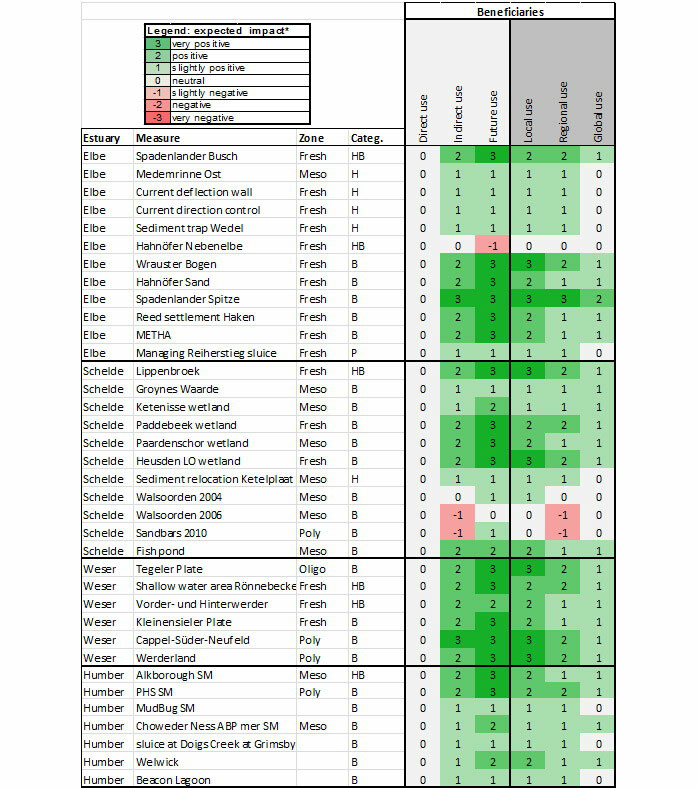 Measures without indication of effects in view of WFD aims not included; measures assigned to more than one measure category highlighted in grey. Summarising, the vast majority of measures originally was not designed to meet WFD requirements. However, multiple very positive or positive measure effects in view of main pressures were indicated and described or neutral effects were stated while an indication of negative effects did not take place. Thus, in many cases several potential synergistic effects in view of WFD requirements can be stated although the measure design did not specifically consider these. This especially refers to measures assigned to measure category ‘Biology/Ecology’ (67% of the pressures are positively affected, Table 29). 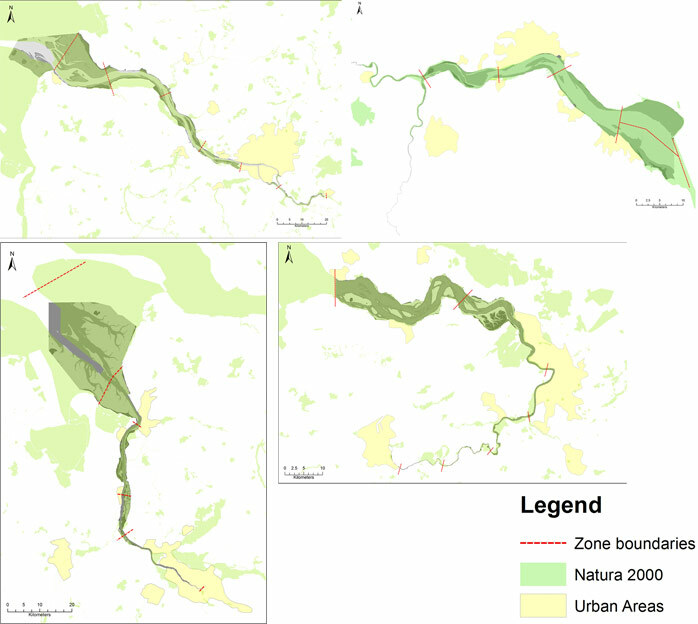 In order to map possible conflicts and synergistic effects of management measures in view of Natura 2000 aims, potential measure effects on available conservation objectives were estimated. Since large parts of the TIDE estuaries are designated as Natura 2000 sites, most TIDE measures are situated within protected areas according to the Birds and the Habitat Directive (Table 30, Figure 8). This also means that Natura 2000 requirements necessarily will have to be considered in the course of future measure planning and implementation processes. The results of the measure effect estimation regarding Natura 2000 conservation objectives for all TIDE measures are compiled in table 31. Summarizing, the vast majority of measures originally was not designed to meet Natura 2000 requirements. However, especially for measure of category ‘Biology/Ecology’, various potential positive or very positive effects in view of the available conservation objectives were stated and described. The results of this part of the measure analysis on a case-by-case basis can be taken from the measure surveys or the measure analysis results available via www.tide-toolbox.eu. In summery it can be stated that within every estuary comparable experiences were made. In the context of the executed management measures (almost realignments) it is announced very often that unpredictable changes in the persistence of the new-built sides occur (e.g. through high sedimentation rates on the side). A conflict of aims between targeted habitat type and the idea of self-preserving nature occurred then very often. A recommendation that is given in a lot of measure examples is, that an adaptive management is needed (measures no.14, 16, 26 & 08) in order to react on changing conditions and additionally accept that some habitats could not exists without management, especially on realignment sides where a lack of natural dynamics occurred (measures no.30, 31 & 05). It may be necessary to consider the creation of compensatory mudflat or shallow water area, as a temporary solution which may not persist forever (measures no 31, 30 & 06). If the management targets were formulated with a wider perspective favourable conditions could evolve without a lot of management effort (measure no 09). Positive experiences like the self-preserving creek system at the Tegeler Plate (measure no 19) as well as the Walsoorden examinations (measures no 19-22) should be analysed in detail to make it possible to transfer the experiences to other projects within the estuary and among other estuaries. To enhance the success of a measure an early stakeholder involvement is necessary (measure no 01). In almost every “crux of the matter” description the necessity of the enhancing knowledge on estuarine functioning and the development of side specific conditions for a beneficial measure implementation is highlighted.